I had been able to sew and knit since I was very young, but the knack of crochetting seemed to be something I just could not grasp. I loved the look of crochet, I tried many times to do it, but no luck at all. For many years I put all thoughts of crochet out of my mind. In 2016 I was blessed with another grandaughter. She was so cute and all I could think of was how lovely she would look in a little crochetted dress. It was time to have one more try at the art of crochet. How difficult could it be, I wondered. My late grandmother had taught herself to crochet when she was 75 years old and almost blind. Gran made beautiful doilies in yarn that were no thicker than a hair on one’s head. Surely I could do it. There was no YouTube or online tutorial back then. Gran did it from reading patterns. I made up my mind. If Gran could do it, then so could I. First thing to learn was how to hold the darn crochet hook. That skill took me hours of watching a basic crochet tutorial online. Once I had mastered that I tried the holding the yarn technique. This proved more difficult. Yarn is slippery stuff with a mind of its own. Finally I was ready to start. Hook in one hand, yarn in the other, oh dear, what a mess. My first chain looked like tangled conglomoration that defied description. I gritted my teeth and chanted to myself, ‘Gran did it, Gran did it, I will do it too’. Thankfully I live alone, except for the dog who would look at me with pity in his eyes. He even put a paw over his face when I uttered obscenities. After about two weeks I felt I was getting the hang of this crochet business. My chains were quite respectable looking. It was time to tackle another type of stitch. Reading a pattern was quite mind boggling, but I persevered and after about a month I crochetted my first beanie. The beanie looked a bit skewiff; the back seam where the stitches joined was as crooked as a redneck’s teeth, but it was a beanie, there was no doubting that. I sent it to my daughter-in-law and she very graciously told me it was beautiful. Even sent a photo with bub wearing it. By now I was inspired to become good at crochet. Over the next year I made heaps of beanies, I made a lovely little dress and even attempted some baby sandals. With each new garment made I became more confident. I must have made hundreds of beanies, shawls and little dresses. My grandaughter was growing and wearing sewn clothing by now. In summer I sewed outfits and winter I crochetted. Last year I tried my hand at amigurumi, or little crochetted animals. This is what I really love doing. 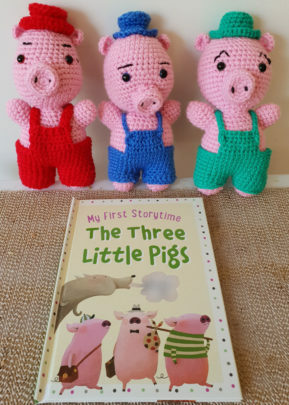 To make it more interesting for my grandaughter, I buy a book, for example, Pooh and Friends and I crochet the characters out of the book. So far I have done Pooh, Tigger, Eeyore and Piget and just more recently I completed the Three little Pigs and the Big Bad Wolf. Amigurumi is quite complicated, but with lots of undoing, redoing, and concentrating I have a fair idea of how to accomplish it. There is much counting involved, I do believe this keeps my mind sharp and the arthritis in my fingers has disappeared. All that twisting and hooking must be good for it as well. There is a lot to be enjoyed with crochet. I am so glad I gave it one last try. What have you taught yourself in your 60s and beyond? Is there a skill you’d like to learn?